Kason's new 29.5 in. (750 mm) diameter cone mill gently reduces up to 35 tons/h (32 tonnes/h) of fatty, heat sensitive, sticky, moist or fragile materials into uniform particles from 125 to 250 microns with minimal fines. Twin pneumatic cartridges allow easy access and swing-down of the conical discharge chute with quick-release clamps and safety switch. A single operator can lower the discharge cone housing and access the internal surfaces plus beater and perforated conical screen for routine cleaning and sanitizing. Macclesfield, UK — A new 29.5 in. (750 mm) diameter cone mill, Kason Model CGM 750, gently grinds fatty, heat sensitive, sticky, moist or fragile materials into uniform particle sizes with minimal fines at rates to 35 tons/h (32 tonnes/hr). 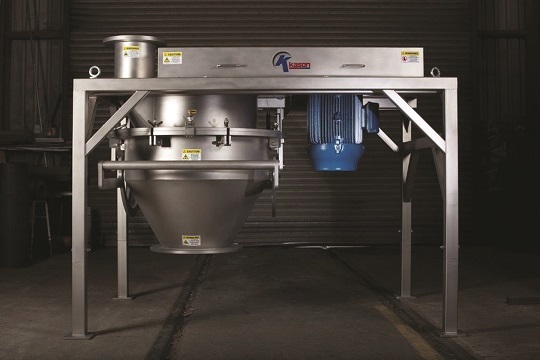 A pneumatic, swing-down conical discharge chute with quick-release clamps allows easy lowering of the 250 lb (114 kg) cone housing and full access to the housing interior, beater and perforated conical screen for cleaning and sanitizing. The unit can be cleaned wet or dry, and is available configured for CIP, SIP or filling with liquid during cleaning. Provision is included for optional air purging of bearings and seals. Smaller models range in diameter from 3 in. (75 mm) for laboratory applications to 27 in. (680 mm) for production capacities. The company also manufactures air classifier mills, universal mills, lump breakers, centrifugal sifters, round vibratory screeners, static sieves, vertical mixers, ribbon/paddle/plow blenders, and double-cone and vee-cone blenders.